THIS KIT, PART NUMBER FS14-3-6, SUPPLIES EVERYTHING REQUIRED FOR BALL BAR EVALUATION OF A CMM TO THE ANSI/ASME B89.4.1-1997 SPECIFICATIONS FOR PERFORMANCE EVALUATION OF COORDINATE MEASURING MACHINES. SAVE ONE HUNDRED DOLLARS AND GET THE TWO BALL BAR CLAMPING FRONT BLOCK. 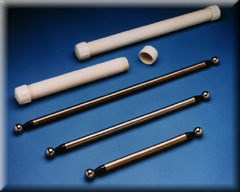 THE KIT INCLUDES ONE FS-14 STAND AND ONE EACH OF THE PBB-300 AND PBB-600 BALL BAR (DUMBBELL)S. THESE BALL BAR (DUMBBELL)S ARE 300MM (11.811 INCH) AND 600MM (23.622 INCH) FROM SPHERE CENTER TO SPHERE CENTER. 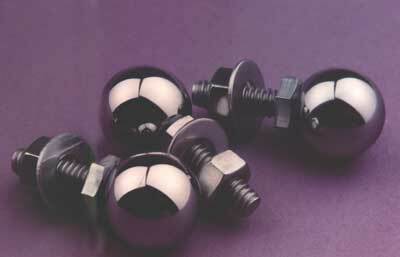 THE BALL BAR (DUMBBELL) ITSELF CONSISTS OF TWO VERY ROUND DIMENSIONALLY MATCHED SPHERES THAT ARE SECURELY ATTACHED TO OPPOSITE ENDS OF A RATHER LONG RIGID BAR. THE FREE STANDING BALL BAR (DUMBBELL) IS A POPULAR APPROACH TO CMM EVALUATION THAT YIELDS EXCELLENT RESULTS. THE BALL BAR (DUMBBELL) IS SIMPLY CLAMPED TO THE VERTICAL POST OF THE BALL BAR (DUMBBELL) STAND. THIS TECHNIQUE REQUIRES AN EXTREMELY ROBUST STAND TO RIGIDLY SUPPORT THE BALL BAR (DUMBBELL). THESE STANDS HAVE BECOME SO BEEFY THAT TODAY'S VERSION TOUTS A 2 INCH (50.8MM) DIAMETER HARD-SURFACED COLUMN THAT IS 14 INCHES (355.6MM) HIGH SUPPORTED BY A MASSIVE 25 POUND (11.34 KG) SOLID CAST IRON BASE. 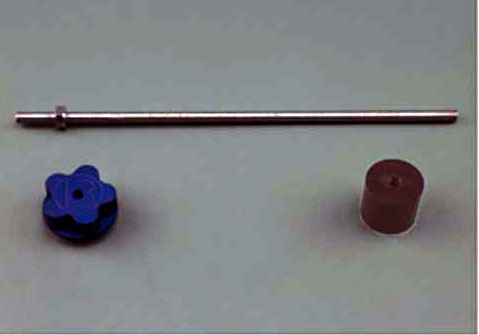 USING THIS TECHNIQUE, YOU BASICALLY RELOCATE THE BALL BAR (DUMBBELL) IN A NUMBER OF DIFFERENT POSITIONS AND AT VARIOUS ANGLES OF INCLINE WITHIN THE MEASURING MACHINE'S DIMENSIONAL ENVELOPE. A SERIES OF MEASUREMENTS CAN BE TAKEN IN A RELATIVELY SHORT TIME THAT WILL GIVE A GOOD PERSPECTIVE OF THE MEASURING MACHINE'S OVERALL PERFORMANCE. YOU CAN APPRECIATE HOW EFFECTIVE THE BALL BAR (DUMBBELL) IS WHEN YOU CONSIDER HOW QUICKLY IT GIVES THE ENTIRE MEASURING MACHINE A GOOD TEST. IT EVALUATES THE ACCURACY OF THE X,Y, AND Z SCALES. THE RELATIONSHIP OF THE GEOMETRIC MOVEMENTS OF ALL THE AXII OF THE MACHINE. THE DATA COLLECTION AND MATHEMATICAL MANIPULATION OF ALL THE DATA PRESENTED BY THE PROBE AND THE SCALES TO THE CALCULATING FUNCTIONS. THE EFFECTIVENESS OF THE COMPUTER ALGORITHMS USED FOR SPHERICAL INTERPRETATION AND LINEAR DISPLACEMENT OF THEIR AXII. IT PROVIDES A REALLY GOOD TEST OF THE QUALITY AND CONSISTENCY OF THE MEASURING PROBE FUNCTION. THIS IS BECAUSE THE PROBE IS CONTACTING A LARGE NUMBER OF POINTS ON THE SPHERICAL SURFACES OF THE BALL BAR (DUMBBELL) AT RANDOM VECTOR POINTS. ALL OF THIS IS DONE WITH A SIMPLE PIECE OF EQUIPMENT THAT DOESN'T EVEN REQUIRE DIMENSIONAL CALIBRATION. 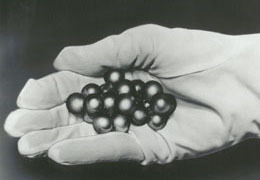 THE BALLS MUST SIMPLY BE ROUND, THE SAME SIZE, AND RIGIDLY FIXED IN THEIR POSITION TO EACH OTHER.